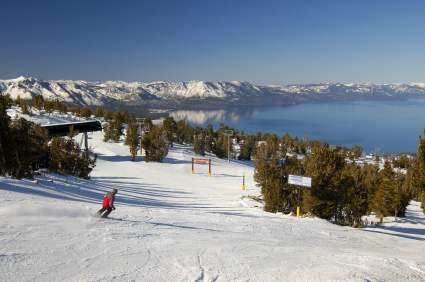 Enjoy a Tahoe ski vacation in one of the best California vacation destinations – Lake Tahoe. North Lake Tahoe skiing includes 11 downhill and 5 cross country Lake Tahoe ski area options, with many additional Lake Tahoe ski areas in South Lake Tahoe. There are many world-class Lake Tahoe ski resorts, and regional ski areas for all levels of skiers. Squaw Valley and Alpine Meadows Lake Tahoe Ski Area - Skiers and snowboarders will love the combined Lake Tahoe ski resorts of Squaw Valley and Alpine Meadows, with over 6000 acres for downhill skiing and snowboarding. Squaw Valley is a world-class resort, host of the 1960 winter Olympics, and has triple black plus terrain for top skiers. Both have runs for beginner, intermediate and advanced skiers. Be sure to check out Squaw Valley High Camp at www.squaw.com. Lake Tahoe makes a great winter California vacation spot even if you don't ski, or if you want to try other winter sports. Here are some sure bets. Ice Skating - Ice Skating Rinks are located at Northstar in the center of the village, where parents can watch from the comfort of outdoor lounges and with nearby fireplaces. Squaw Valley High Camp has a skating rink far above the valley, accessible by the tram ride. Snowshoeing – Snow shoes offer another alternative to ski Tahoe, and a chance to enjoy the beautiful scenery. Try a showshoe trip through Squaw Valley Meadows or a moonlight hike at Sugar Pine Point State Park. You can also snowshoe on most cross country ski trails. Sledding and Snow Tubing – Kids and families love the thrill of sledding and tubing. You can bring your own sled to North Tahoe Regional Park, or pay for sledding and tubing at Donner Ski Ranch or Granlibakken. A Tahoe ski vacation is a popular winter weekend activity for Northern California residents from the San Francisco Bay Area, and northern California. Major routes include highway 80 for north shore and highway 50 for south shore. Snow chains may be required depending on the weather and road conditions. If you are flying to the Lake Tahoe ski area, the closest airport is Reno-Tahoe International Airport (RNO) in Reno, Nevada. Shuttle service is available to your hotel.